(Nanowerk News) A research collaboration led by Paul McEuen, the John A. Newman Professor of Physical Science and director of the Kavli Institute at Cornell for Nanoscale Science (KIC), is taking kirigami down to the nanoscale. Their template is graphene, single atom-thick sheets of hexagonally bonded carbon, famous for being ultra thin, ultra strong and a perfect electron conductor. In the journal Nature July 29 ("Graphene kirigami"), they demonstrate the application of kirigami on 10-micron sheets of graphene (a human hair is about 70 microns thick), which they can cut, fold, twist and bend, just like paper. Graphene, like the paper models, is strong but flexible, and can be stretched or pulled with forces comparable to those exerted by motor proteins. 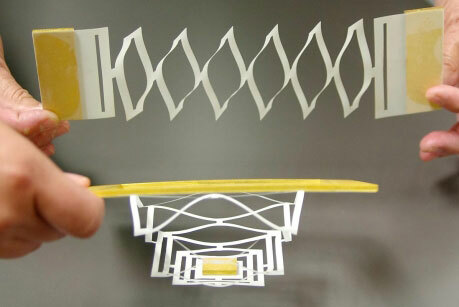 The researchers tested their graphene kirigami designs on laser-cut paper. They found that a graphene soft spring behaved similarly to the paper model. The study's first author, Melina Blees, a former physics graduate student and now a postdoctoral researcher at the University of Chicago, said she received an “enthusiastic welcome” from the Department of Art, where the researchers spent time in the library studying paper and fabric designs and dreaming up ways to translate them to graphene. They borrowed a laser cutter from the College of Architecture, Art and Planning shop, creating paper models of their designs, before hiking over to the Cornell NanoScale Science and Technology Facility to fabricate them out of graphene. “It was really true exploration, cutting things out of paper and playing with them, trying to imagine how a 'hanging kirigami mobile for kids' could become a nanoscale spring for measuring forces or interacting with cells,” Blees said. With one sheet of graphene, for example, they made a soft spring, which works just like a very flexible transistor. The forces needed to bend such a spring would be comparable to forces a motor protein might exert, McEuen said. Entering the realm of biological forces, the experiments open up a new playground of ideas for, say, flexible, nanoscale devices that could be placed around human cells or in the brain for sensing, McEuen said. The researchers also demonstrated how well graphene bends in a simple hinge design, quantifying the forces needed. Opening and closing the hinge 10,000 times, they found that it remains perfectly intact and elastic - a potentially useful quality for foldable machines and devices at that scale. Building on the principles from the paper, a related research team at Cornell has just received Department of Defense funding to continue developing technologies around flexible materials like graphene, using some of the kirigami principles demonstrated. Blees added that over the course of the project, she was able to get an intuitive grasp of graphene's properties - rare for nanoscale scientists.